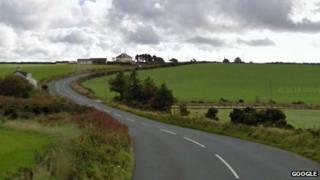 A teenager has been killed in a car crash on the Isle of Man. The boy, believed to be 17 years old, was a passenger in the car that crashed in Foxdale Road near Archallagan Plantation at about 00:10 BST. He died at the scene. The driver and two other passengers were taken to Nobles Hospital for treatment. Police have arrested the driver on suspicion of causing death by dangerous driving. No other vehicles were believed to be involved. The Renault Clio had been travelling from Eairy towards The Braaid at the time. Insp Derek Flint said: "This was a challenging scene to deal with for all the emergency services - all who stepped up to the bar to professionally deal with the difficult issues confronting them. "All the next of kin have been informed and over the coming days we will be working to establish precisely what led to this tragic event."